Today we met at the Squid Lips bar and grill because it is right next to the charging station at the Eau Gallie Library. Al Lococo gave us an explanation of the different adapters he has collected or built himself over the years for his electric vehicles. He uses a lot of them on road trips when plugging in at the various hotels he stays at that allow him to get a nice, overnight charge while he sleeps. As more and more hotels and businesses install the standard, J1772 plug charging stations, it will be MUCH easier and become commonplace for those staying overnight at hotels to charge their EV. Remember, if you are a business owner and want to attract more business a simple investment in an EVSE (electric vehicle supply equipment) is a no-brainer. Just check our charging station info page for all the info you need for the various types, sizes, and configurations of charging stations. You can also call or email us if you have any immediate questions on all things EV related. We also had a guest from the Brevard Environment and Sustainability Team visit our meetup and tell us all about the upcoming city council meeting at Melbourne City Hall on July 25 at 6 pm. We will be there to show support for the city to create an environmental and sustainability committee and to pledge goals for renewable energy and electric car fleets for city use. We can show how much we save and how little money we spend on maintenance on our personal vehicles that would translate to electric city vehicles. 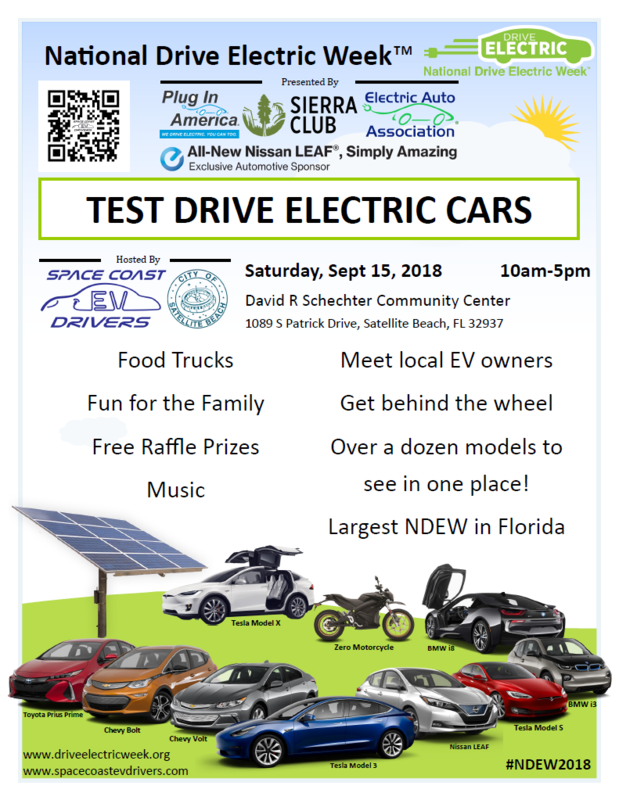 We are still pushing to make sure everyone signs up for National Drive Electric Week in Satellite Beach on September 16 and tell everyone you know to sign up too. The newspapers and radio like to see that hundreds of people have signed up for an event to get really excited. In 2015 we had almost 200 attendees. In 2016 we had almost 300 attendees. We are hoping to get almost 400 or more this year! Make sure everyone you know signs up to attend our event to ride in a Tesla, or any other make model EV we’ll have there. From the Nissan Leaf to the Chevy Volt, the new Chevy Bolt, BMW i3 and i8, the Kia Soul EV, the Fiat 500e, and the Ford C-Max Energi. Below is a list of all of the current numbers of members and makes/models we hope will be there at the event!